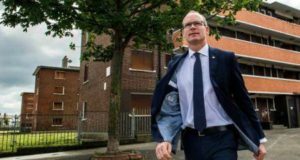 In the interview with Matt Cooper the on Today FM last Thursday 29th September, Minister Simon Coveney said that “We will look at ways in which we can reduce cost, streamline decision making and approval and inspection processes and so on, and we are looking at that”. “We haven’t seen results in a major way yet. The cost of building houses is a key issue…Interesting that the SCSI published the detail of what it costs to build a house… Regulations are predominantly covered by professional fees €5,500… land acquisition costs are close to €60,000… We will look at ways in which we can reduce cost, streamline decision making and approval and inspection processes and so on, and we are looking at that”. 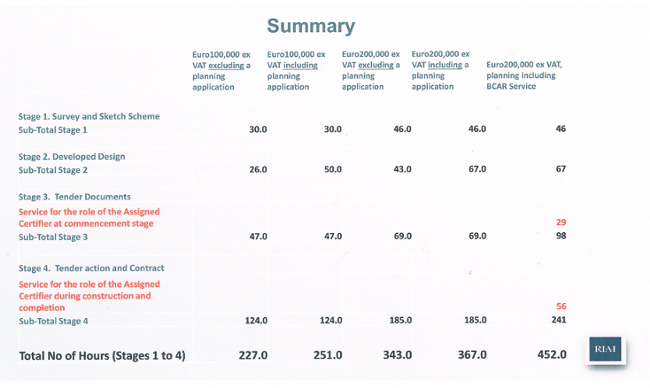 It is surprising that the Society of Chartered Surveyors of Ireland (SCSI) are so far out of line with the Royal Institute of the Architects of Ireland (RIAI) WHO estimated last May that the Assigned Certifier role for a €200,000 (excl. VAT) residential extension project takes an additional 85 hours on top of standard architectural services. The RIAI table suggests a cost to the consumer of approximately €8,000 for Assigned Certifier statutory inspection duties (incl. VAT) for a modest domestic residential project. This excludes the standard architect’s fees and the other professional BCAR costs such as the cost of Design Certifier, other Ancillary Certifier (services and structural engineers) fees, contractor and sub-contractor costs, phasing and financing of delays, defensive specifications etc. Previously the Royal Institute of the Architects of Ireland estimated that the cost of professional fees of BCAR SI.9 procedures to the residential sector at up to €300m per annum and would require 2-3 million additional hours to operate. Just last year former Minister Alan Kelly ordered a ministerial review into its effectiveness and cost of BCAR which resulted in an opt-out of onerous and costly administrative procedures for once-off housing. 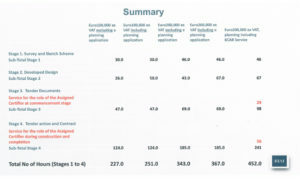 The BCAR cost for a typical house was estimated by the Minister at over €50,000. Currently there are no plans to launch a Ministerial review of building control costs in the multi-unit sector, despite widespread calls for a proper cost-benefit analysis. Minister Coveney has a very ambitious housing programme and he can’t afford to get this one wrong. This entry was posted in Building Regulations on October 4, 2016 by BRegs Admin.